The fight of being a Christian is not always a violent opposition to evil. Most of the time, the fight is just doing the mundane thing you are supposed to be doing in the face of an otherwise hopeless situation. For example, consider the widow of Zarephath, in 1 Kings 7. 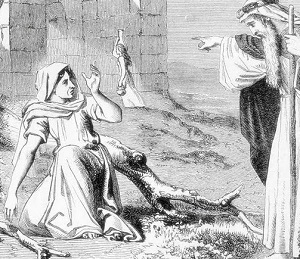 Elijah was sent to her, and when he found her she was gathering sticks. When the prophet asked her for a morsel to eat and something to drink, she replied that she had only a little meal and oil. Her plan was to gather some sticks so that she and her son might eat, then die. It seems like such a simple response. In reality, it is profound. The command to not be afraid (which, by the way, appears at least 365 times in the Bible) and to continue with the plan for today. In the face of desperate times, that can take all of your strength. That is still part of the fight of being a Christian. It is an act of faith, and a witness of hope. Knowing the Gospel, we can likewise remember that we pray for our daily bread, not a steady paycheck. Jesus tells us not to worry about tomorrow. So carry on, keep gathering sticks. The more hopeless the situation, the more amazing His intervention when it comes. Previous PostMen and Abortion: Free Pro-Life Conference MP3sNext PostCheap Entertainment: First World Temptations?